I have studied in a public school run by a Sikh trust and I grew up in Army cantonment. Both these facts exposed me to abundance of sikh and punjabi culture and food habits from dal makhani, ajwain parantha, sarson ka saag, makke ki roti to kadha prasad served in Gurudwaras. I can still remember and feel the taste of kadha prasad so many times on my tongue. The hot prasad was served on our palms as we queue out of the Gurudwara and I would gobble it up as soon as I was away from the last step of the exit. For a long time I struggled with creating the same flavour and the correct proportion of sweetness and moistness. After literally years of struggling with it, finally I struck the perfect balance. And the true appreciation came when all my friends including Punjabi ones, started relishing the halwa like a treasure. Adding the remaining ghee is upto you, for a good halwa you will not need it but if you wish to be close to kadha prasad feel then adding same amount of ghee as flour is important. 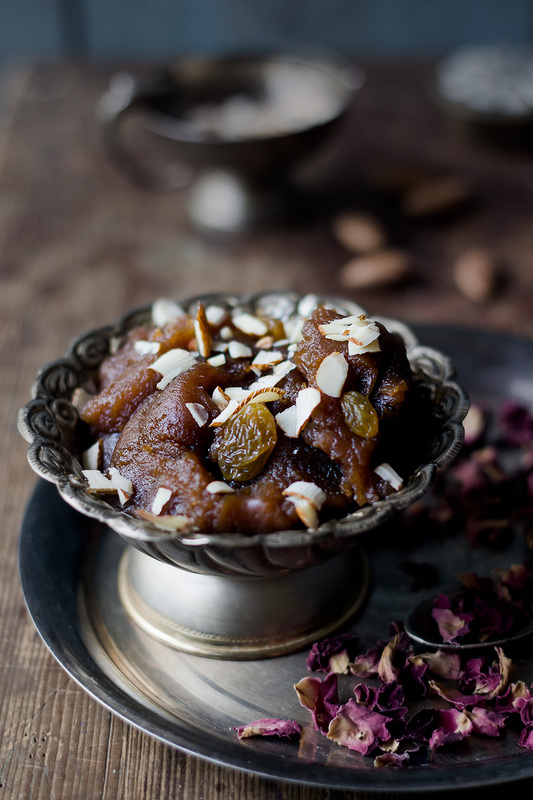 A deliciously rich, fragrant and melt in the mouth aate ka halwa for you. 1. In a thick bottom pan, melt ¾th of the ghee. Add flour to the melted ghee. Allow the flour to roast on slow flame. You may need to continuously stir to avoid burning. In the meanwhile, in another deep pan, boil sugar and water together to make syrup. Boil till sugar is completely melted and syrup is just very lightly thick. Set aside the syrup. 2. When the flour is a nice deep brown in colour, remove from flame. If required, add remaining ghee. Now add sugar syrup slowly, while continuously whisking the flour. Keep rigorously whisking the flour mixture as you add water to avoid any formation of lumps. Add raisins to the mixture and transfer the pan back to the flame and continue to roast till water is completely absorbed for another 4-5 minutes. Garnish with almond slivers and serve hot. You can alternatively add sugar and water directly in step 2 instead of first making a syrup, but it gives a better flavour if the syrup is formed first. Whisking the flour mixture rigorously as you add water is very-very important, to avoid any formation of lumps. Once lumps are formed in aate ka halwa, it is very difficult to remove them. You can soak raisins in very little (1-2 tsp) water to allow osmosis to take place. And then add these soaked raisins to the flour in step 2.